The great Brazilian architect Oscar Niemeyer who died on 5 December, was a character for sure. I met him in 2001 on a visit to Rio and Brasilia that a few years later led to a book and a few articles. A Carioca friend, a composer, put me in touch with Niemeyer and we secured an appointment at his Copacabana office. Driving downtown to the appointment I was paralysed with nerves, not helped by some mischievous advice from my friend’s brother-in-law on how to address the great man. ‘O senhor Niemeyer. Você e um Saco’ (Mr Niemeyer. You are a pain in the arse’). We arrived at a turquoise art deco block on the beachfront, went to the top floor, entered the office, and were shown to a desk adorned with a large black-and-white photograph of two young women lying on their backs, naked. A tiny, prune-like man in a crisp shirt greeted us – Oscar Niemeyer. Chainsmoking cigars throughout the meeting, he really was remarkably obliging. He showed us a funny animated film, in which he arrived in his saucer-shaped MAC building, as if from outer space. We talked about his latest work, jazz, his routine (beer, sketching the girls on the beach), Brasília. Brazil’s futuristic capital, inaugurated in 1960, was to be the centrepiece of my trip. I’d planned a week there. A week, Niemeyer laughed. I was mad. A day or two was enough. The remark about Brasilia stayed with me though, because it revealed a distinctive, and curiously two-dimensional, attitude to architecture. Niemeyer’s buildings are well-known as photographs and as recently as 2001, photographs were as close as most of us were likely to get to experiencing them. Fortunately, they’re fantastically photogenic. 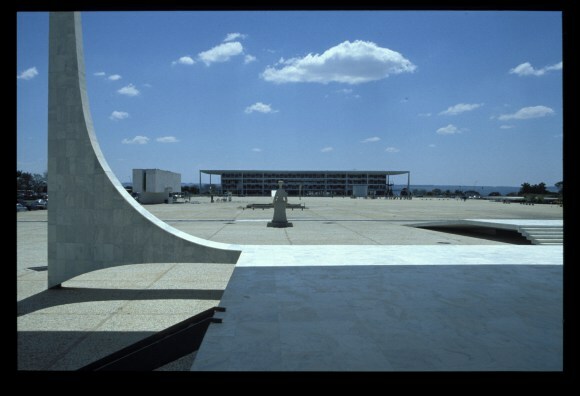 The images of Brasília’s inauguration in April 1960 by Rene Burri and Marcel Gautherot are among the best, and most widely published images of modern architecture. Starkly dramatic, they signify, better than almost anything else, what it meant to be modern. The reality is often something else. The pictures give no idea of their environmental performance, often hopelessly at odds with their surroundings. The cathedral, all glass in a city with one if the highest indices of sunshine in the world, is a furnace (a literal hell in summer, perhaps a joke – Niemeyer was an atheist). The ministry buildings, aligned perfectly so one face would be blasted by the heat in the morning, the other in the afternoon. Reality intrudes in terms of construction, too. The buildings of the capital are beautifully done, but elsewhere, most are not, Niemeyer’s pure forms invariably undermined by crude finish and poor (or non-existent) maintenance. Brazil’s cities are littered with these modern ruins. The 1996 Museu de Arte Contemporanea in Niteroi, is a case in point. Lauded by the world’s architectural press, it looks superb at a distance. Up close it’s all lumps and bodges, a primary school art class’s approximation of a flying saucer. Niemeyer himself was well aware of such criticisms, but they meant nothing to him. This was less to do with his unassailable prestige, than an attitude. He genuinely didn’t feel any responsibility towards the buildings once built. He was an artist, first and foremost and as such, his job was to create new forms. You might as well criticise Surrealism for failing to care adequately for lobsters, or design good telephones. That attitude has saddled Brazil with some expensive architectural conservation problems – but it has also proved enormously influential. Libeskind, Gehry, Zaha Hadid and their followers have all carried forward the concept of architecture as icon-making, and that concept, in turn, powerfully informs architectural training the world over. It’s a problematical attitude as regards the future of architecture. But it has produced some spectacular, highly affecting images of modernity. Niemeyer had plenty of shortcomings as an architect, but as an image-maker, he was peerless. Remember him through the pictures of the work, not the work itself.